They are always capable of surprise. And yet, the result is so frequently the same. 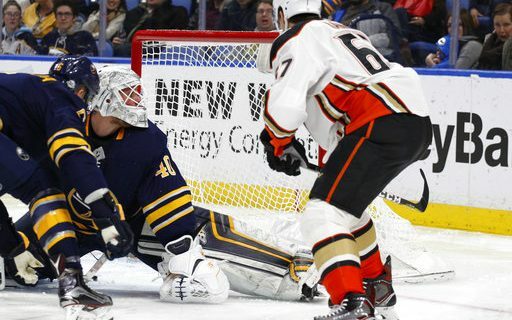 The short version of the story of the Tuesday’s game in the KeyBank Center is that the Sabres lost to the Anaheim Ducks, 4-3, in overtime. It was Buffalo’s fourth straight loss, all of them coming on home ice. The basic facts hardly tell the story of a game in which the Ducks – which ended a three-game skid – scored an unlikely goal to take a third-period lead, only to give that lead back in the final seconds – and then win it in overtime. We should have known this could be an interesting night by what happened near the start. Girgensons scored a short-handed goal in the first four minutes by throwing his own rebound off of ex-Sabre and current Duck goalie Ryan Miller and having it dribble into the net. Anaheim had the better of the play in the second period, but had to get a late goal simply to draw the game even at 2-2. That set up the bizarre turn of events in the third period. The Sabres were playing rather well when the Ducks got the puck bouncing around the Buffalo goal. Ryan O’Reilly tried to clear the puck out of danger, but instead hit goalie Robin Lehner’s stick with the puck – which went back into the Sabre goal. Shocking. There was still 8:30 left to play in regulation. At this point in a long season, the Sabres might have been so demoralized by that turn of events that they would collapse. Instead, Buffalo continued to play hard. After three straight Anaheim icings in the last two minutes, the Sabres finally broke through for the tying goal. It was scored by – naturally – O’Reilly. The arc of the moral universe may bend toward justice, as Dr. Martin Luther King once said, but usually it takes more than eight minutes. Buffalo obviously had all sorts of momentum going into overtime, but the team has had huge problems earning wins in games that go longer than 60 minutes. The Sabres were 3-9 entering the game in such situations. Then Anaheim’s Adam Henrique took a shot from the middle of the zone, apparently deflecting off the stick of Rasmus Ristolainen, and beat Lehner to go into the corner of the net. Make it 3-10. There was a little talk in the Sabre locker room after the game that it was nice to get a point in the standings for getting the game to overtime. That’s certainly true. But that didn’t mean the ending wasn’t depressing to the side wearing blue and gold. It’s a game and a season that continues to test the patience of everyone connected with the Sabres. “It’s where we’re at right now,” Housley said. The Sabres will try to avoid the stigma of losing its fifth game in a five-game homestand – time to check the record book about that occurrence – in a Thursday night contest against the New York Islanders.